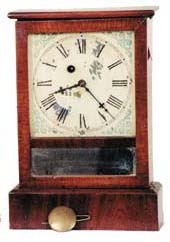 Waterbury Clock Co. "Farmers", miniature shelf clock, 12 inches high. Good old glasses, label, and mahogany veneer case. Very good old dial is beginning to flake. 30 hour time only movement is running.